American Apparel "Light Year" & Sally Hansen "Glitz Gal"
Although this has nothing to do with what I'm talking about, I just wanted to show you what I have on my nails right now because I can not stop staring at them!!! 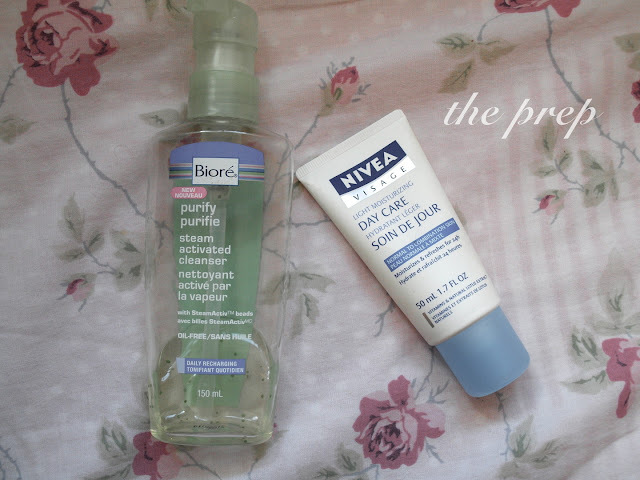 Bioré "purify cleanser" & Nivea "Day care moisturizer"
Before I put on any makeup I make sure I wash and moisturize my face with these two products. The face wash is amazing, I think that my skin looks awesome after I use it and my skin seems to have cleared up after using this for a couple weeks. It does say it is best used when in the shower because the steam helps to activate the cleanser, but you can use it out of the shower but it makes your skin feel more refreshed when used in the shower. I don't really have much to say about this moisturizer, Nivea is a great brand and i've been using this for about a year now and it is great for the day because it doesn't make your skin feel oily or heavy but i'm sure that there is way better moisturizers out there. Smashbox "photo finish primer" & Benefit "stay don't stray" & Covergirl "natureluxe foundation" & Physicians Formula concealer & L'Oreal "magic lumi concealer" & EcoTools "powder brush" & Rimmel "stay matte powder"
For the face I start off with my Smashbox Photo Finish primer which is getting pretty old and dirty but I love it because it feels so nice and smooth when applied to the skin and it makes my makeup look flawless. Then I will put on a small amount of my Covergirl NatureLuxe foundation which is a great light coverage foundation for someone who doesn't have much to cover up but still likes the comfort of knowing they have a bit of coverage. Now I will dab on some of my sample size Benefit Stay Don't Stay eyeshadow and concealer primer all around my eye area. Once that has set in I will put on my L'Oreal Magic Lumi concealer underneath of my eyes to brighten up and conceal my dark circles, I will also put it on the high points of my face to highlight. When I'm done with that I move over to my Physicians Formula stick concealer to cover up any little spots on my face. 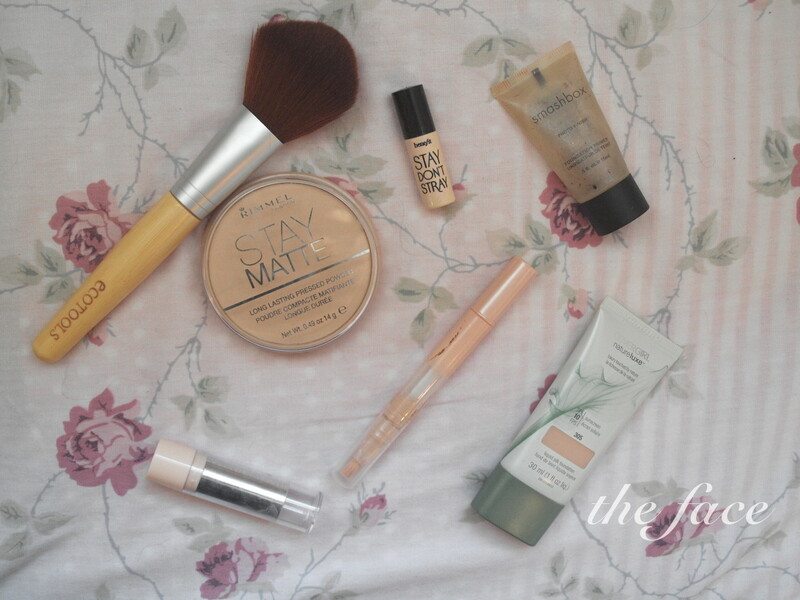 To finish off my face makeup I put on my Rimmel Stay Matte powder with my EcoTools powder brush, I love the powder because it really does keep my face matte all day! 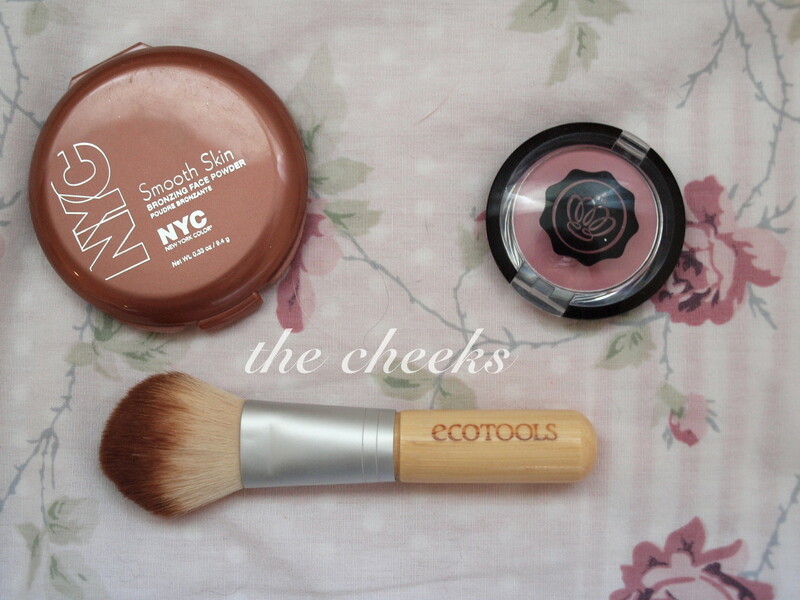 NYC "sunny bronzer" & Glossy Box blush & EcoTools "mineral powder brush"
I love to contour my face with the NYC bronzer in Sunny with my EcoTools powder brush, the bronzer is the perfect shade and really affordable. I got this blush from a glossy box last year and it has a blue undertone and I love that about this blush, I do have to say that this is my go-to blush for everyday. Urban Decay "NAKED pallet" & MICA "gel liner" & LORAC "3D liquid lustre drops" & Urban Decay brush (came with NAKED pallet) & Benefit "they're real mascara" & ELF "dense blending brush" & EcoTools "blending brush" & Revlon "eyelash curler"
Next I will take the shade Buck on my very fancy ELF blending brush to put into the crease for definition. I use this EcoTools blending brush to get rid of any harsh edges, then I take Virgin on the same brush to highlight the brow bone and inner corner! No photo will ever be able to do this stuff justice, it looks so pretty in the sunlight and isn't too much shimmer for daytime wear. It has a dropper applicator so I put one drop on my hand and use my finger to lightly pat it all over my eyelids. I got this eyeliner in a IPSY glam bag last month and i've used it everyday since! It is so creamy and easy to use, I love it so much. To finish off my eyes I curl my lashes with my Revlon eyelash curler and apply a very heavy coat (maybe a little too heavy as you can see my eyelashes are quite clumpy) of my Benefit They're Real mascara, if you haven't tried this stuff out... You really need to. Revlon Matte lipstick in the shade "pink pout"
Your photos are very pretty! I'd be interested in a post about your monroe piercing because I've been considering getting one for a while and I want to know what it's like. great post :) i love that nail polish! 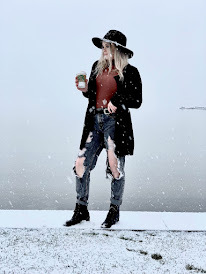 thanks for posting on my blog, im new to all of this too! glad you liked it :) ive followed you, could you follow me back? Your such a beauty Karlee! 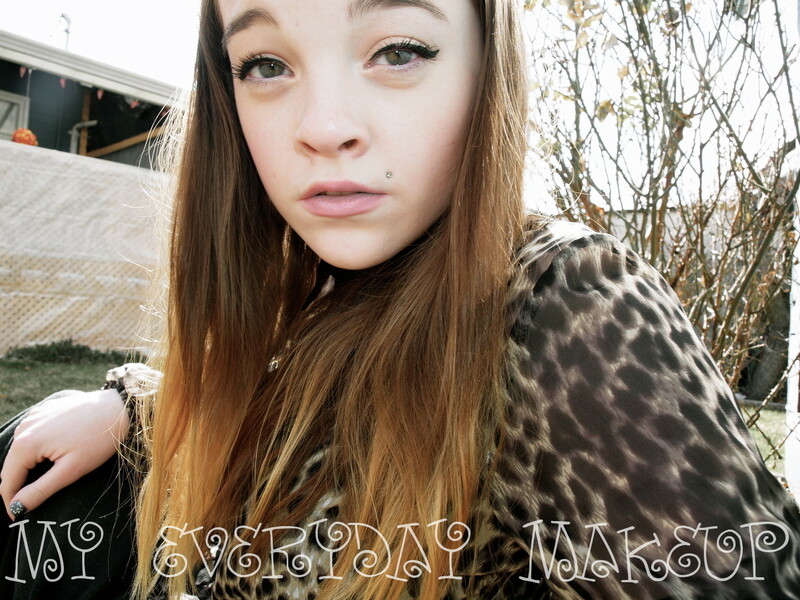 I love the way you do your eyeliner! I'm wanting to try out some more of their nail polishes, do you have any favourites? Thanks for sharing. I love the eyes. I can never get that perfect style on my eyelids - perhaps it's cause my eyes are massive! thank you :) Hah, well I guess you have to do whatever works best! I love the Sally Hansen! No problem, thanks for stopping by mine! Your makeup is so gorgeous, I love my naked palette as well and I need to try the mascara! Thank you (: yes you do it is awesome! This was a great post, I really like the way you set it out. you have such a beautiful face! 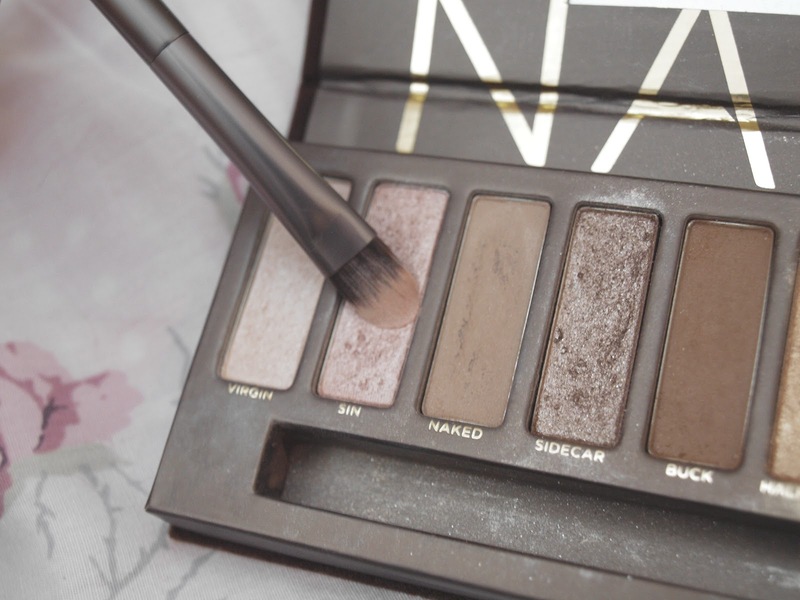 and this naked palett is great!really neccessary! yes, it is defiantly an essential! love this post! It's great knowing what products people are using. 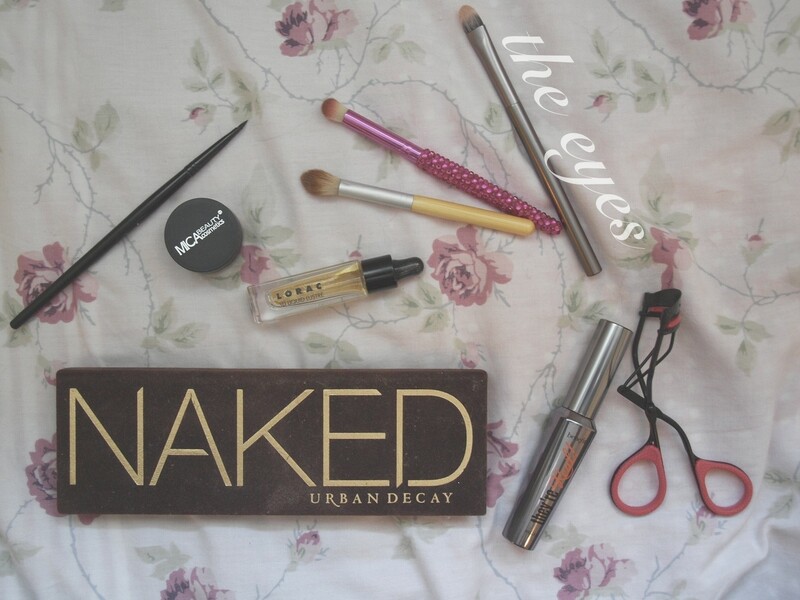 I need to get my hands on a Naked Palette! Nice! love your cat eyes! Ha I think it's easier for me because I have a bit of a lazy eye :( so I can make it thicker on that eye and thiner on the other so it looks normal! Love love love your nail polish! Do you apply some brightener on ur lower lash line?? Or are they naturally that bright? How lucky! I think they are just naturally like that, never noticed that it was like that aha. thanks! Do you have bloglovin, hellocotton or shesaidbeauty ? I would like to follow you. Since google reader is going to be deleted I don't follow on it anymore. You can answer me on my blog. it is so nice! I really need to buy a new one though!